This blog post contain some of the articles and projects I have read and used as part of a touch project for Silverlight. Please let me know if you have read a good article about touch for Silverlight. I’m a Silverlight MVP and I love Silverlight! These days I often hear “Isn’t Silverlight dead?” – well to some Silverlight have never really existed but I think Silverlight have a bright future ahead. I also hear a lot complaining about problems with the IPad due to the fact that IOS is just a mobile OS. It has been reported Windows 8 will be able to run on ARM processors. This will open up some new possibilities for Windows based slates and I guess we will see hardware looking like IPad – but running a full OS instead of a mobile OS. If Apple want to compete with Windows 8 running on ARM processors they need to upgrade the IPad – they need to run a full OS. A few days ago Apple launched OSX Lion. It looks great and with its new feature to show the apps like on an IPad I guess Apple have taken the initial step to launch IPad 3 running OSX Lion. With a full OS like OSX Lion it will be possible to run Silverlight on IPad 3. Since PDC in late 2010 there have been lots of rumors and guessing about the future of Silverlight. In spring 2011 at MIX11 Microsoft released the beta of Silverlight 5 and announcing the final release of Silverlight 5 in late 2011. With this post I’m trying to gather some of the most objective articles written about the future of Silverlight. Premature cries of Silverlight / WPF skill loss. Windows 8 supports all programming models. If you think I’m missing an article please let me know at @xamlgeek. HTML5 is getting more and more focus. The pieces in the standard is slowing falling into place and lately Microsoft announced that the Windows 8 touch UI will support HTML5 based tiles. The HTML5 plugin (aka modern browsers) is pushing the penetration of HTML5 (75,64%) and recently it passed the Silverlight penetration (75,1%) worldwide. But what is going on in Denmark?! The Silverlight penetration is 74,17% but the HTML5 penetration is 41,1%. Seriously!! Why is the HTML5 penetration that low in Denmark compared to the worldwide penetration. Did we forget to upgrade our browsers?? All figures are taken from riastats.com. Tonight I’m doing a talk at “Silverlight developers in Denmark” (SLDEV). The talk will focus on the new features in Silverlight 5 and I promise I will bring lots of demos. A long requested feature coming with Silverlight 5 is the opportunity to set the default file name in the SaveFileDialog. In previous versions of Silverlight this missing feature have resulted in some bad user experiences, but finally it is here and it is easy to use. To demonstrate it I have create a demo writing a text file to the computer allowing the user to set the default file name from the very beginning. 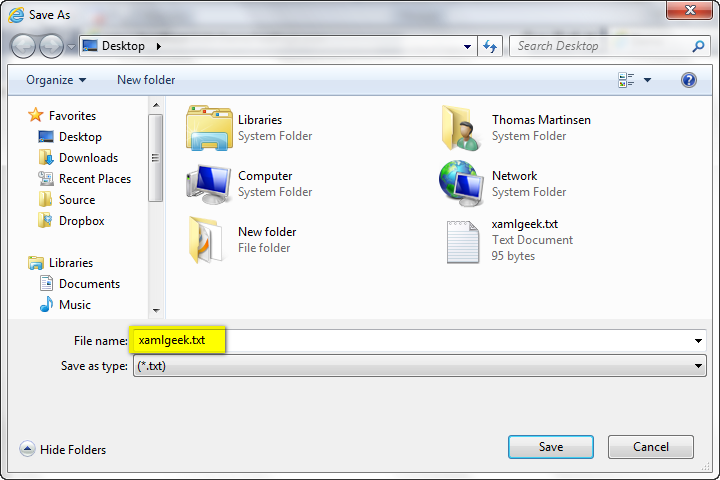 When the user clicks the Save-button the SaveFileDialog is shown and the user can save the file locally on the computer. The text from the TextBox is parsed to the SaveFileDialog as the default file name. 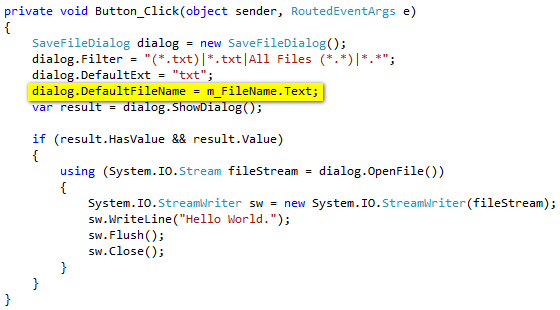 In the code I have set the Filter, the DefaultExt and the DefaultFileName on my SaveFileDialog instance. This provide an optimal experience for my user when saving files. 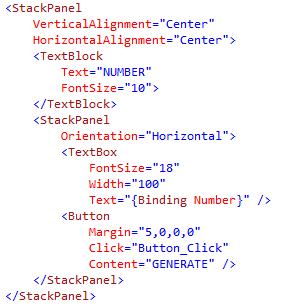 One of the cool new tool features in Silverlight 5 is the XAML debugging features. It is limited to debugging bindings in XAML but that is an extremely useful feature. I have created a demo showing the few steps needed to debug bindings in XAML. The demo consist of a TextBox containing a number a Button to refresh the number. The number is a random number. The Text property of the TextBox binds to a property called “Number”. It is a Dependency Property defined in my code-behind. To make the binding work I have set the DataContext of the page to its self. Whenever the Number property is updated it will automatically update the Text value on the TextBox. As simple as it is I can spend hours looking for errors if I e.g. misspell the property that we use to bind to. Before Silverlight 5 I would get a hint in the Output window if I had a BindingExpression exception. 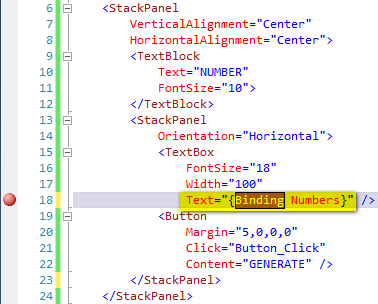 In Silverlight 5 I can add a breakpoint to the binding directly in the XAML. Debugging the XAML above I get an exception with a BindingExpression path error and enables me to easily identify the error. You can download the sample here.